The majority of my “day job” is taken up with being the “Clinical Lead” for University Hospital Southampton Emergency Department (ED). This is one of those job roles in clinical management that is usually ranked alongside “Consultant Liaison for Car Parking” and “Associate Medical Director for Information Technology” in its desirability, but I must admit though that I enjoy this role hugely. Yes, it has its challenges, but I am incredibly lucky with the support I get from both within and without my department and I truly believe that together we are improving both patient care and the environment that out staff work in. One part of my role is to annually “Job Plan” the permanent medical staff (both consultants and specialty doctors). In essence, this is ensuring that everyone is given everything they need to succeed at work, but also to be sure that they are completing the roles that they have been given effectively. Senior medical staff in the UK have two major parts to their contracts. The first is “Direct Clinical Care” (DCC), stuff that involves patients: shopfloor sessions; responding to complaints; checking Xray results and the like. The second is “Supporting Professional Activities” (SPA) – things that help both the department and the doctor develop: teaching; governance; leadership; research; etc. Depending on their contract, consultants at UHS have 8-10 hours per week for these activities. Considering the pressure on EDs this time is at risk of being more and more squeezed as senior doctors are asked to spend more and more time on “DCC”. Of course, the hospital is also investing large amounts of money in this SPA activity, so they need to be reassured that this time is used well. At UHS we have developed a “Leadership Portfolio” which outlines all of the SPA roles in our department. It states explicitly what is expected giving the doctor a list of general duties and to whom these are accountable. The portfolio was developed collaboratively with each person who was already performing the role asked to write their own entry, using a standard format. Each of these was then reviewed by the group and a suitable amount of time allocated through discussion. Once completed, the portfolio was shared with our senior management (both clinical and non clinical) to ensure they were happy with the job descriptions and the time allocated. The time is expressed as “PAs” – these are “Programmed Activities” where one PA is equal to four hours. We have just been through our first round of job planning after the Portfolio was introduced and it really has made a difference to how we approach SPA activity. Tasks and role are clarified and all parties know what is expected. I think that really has lead to a very successful year of non clinical activity that both the department and hospital as a whole has benefited from. The Portfolio is always developing and this year we have tinkered a bit with some of the roles, adjusting the time given to some and refining some of the duties. We also want to make this document collaborative across the whole department and this year will add in the senior nursing roles too. 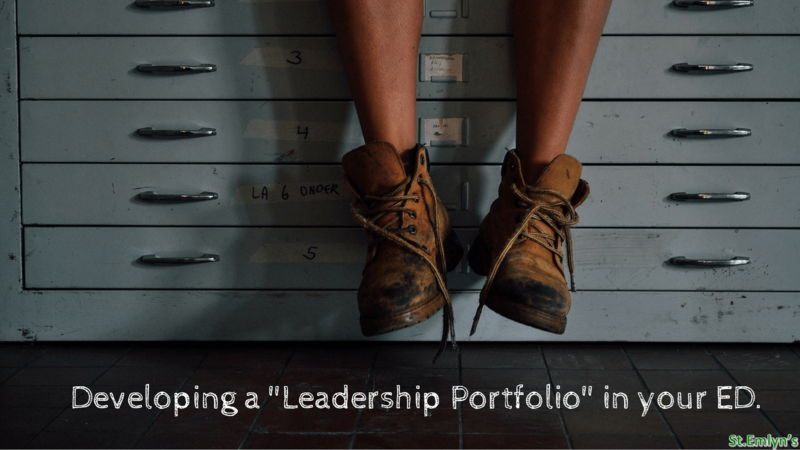 This blog post arose from a talk I gave recently at the “RCEM Clinical Leaders’ Day”, where many of the delegates asked for more information about how we developed the Leadership Portfolio. I am very happy to share it here and hope look forward to hearing if you have found using something similar in your hospitals useful. Previous: Previous post: 101 Reflective Lessons from a Year with Sydney HEMS. Part One: Education.